Late Wednesday night, February 22, 2017, around 9pm EST, the Trump Administration released its new directive that rescinded the federal protections for transgender students in public schools and universities. Policy until this point, passed in the Obama administration, directed there be protection for all students equally, to ensure they had access to the bathrooms, locker rooms, and other facilities based on their identified gender, per their Title IX rights. But the joint statement from the Trump Departments of Justice and Education used as their reasoning that the protections had “given rise to litigation” and thus they were withdrawing the protections because of the “legal issues involved.” The Trump Administration insists this is a “state’s rights” issue, despite Title IX’s clear federal jurisdiction (the same excuse used by such venerable segregationist abusers as George Wallace). What happens next for transgender students in states which will not afford them protections is what many fear for a population where an estimated 30% attempt suicide and more than 40% self harm because of social rejection, pressure, and outright abuse. As educators, our role has always been significant with regard to advocating for and protecting our most vulnerable students, but this newest move from the Trump administration makes it clear teachers will need to step up even more. Unfortunately, research tells us that often the violence and abuse experienced by transgender students is at the hands of their own teachers and administrators. The Obama-enacted protections are relatively new and rose out of a debate that occurred in North Carolina over the law known as “HB2.” HB2 was passed in March 2016 as a direct response to an ordinance passed by the City of Charlotte that prohibited discrimination against people on the basis of sexual orientation or gender identity in public accommodations. There immediately rose an outcry from anti-LGBTQ people around the state that somehow sharing a public bathroom with someone who identifies as the same gender they do would be “dangerous.” The Republican-controlled state assembly in North Carolina passed HB2 and immediately saw national reaction. Large organizations, including the NBA, and other companies began to withdraw business from North Carolina because of the state-endorsed discrimination. As other states, like Mississippi, began to introduce their own HB2 laws, the Obama Administration moved to extend protections at least to students in public schools under Title IX. be denied the benefits of, or be subjected to discrimination under any education program or activity receiving Federal financial assistance. The Supreme Court is set to decide whether this portion of Title IX applies to Transgender students this year in a case involving Gavin Grimm, a high school student in southeastern Virginia. When Gavin first transitioned in his sophomore year of high school, his school allowed him to use the boys’ bathroom, just like every other boy at his school. That was until parents got word of his bathroom use two months later and complained to the school board. Gavin then had to go before the Gloucester County School Board just to ask to use the bathroom. The school board ruled against Gavin in a 6-1 vote, denying him the right to use the bathroom that matches his gender. The right to exist is no small thing, and that is what we are talking about today. The Trump Administration has decided that despite Title IX, there should be no federal protections for trans students to exist. What we say as a country with this new policy is that we do not recognize the humanity of these young people who should enjoy the very same rights as everyone else. Just because some Americans do not understand or do not personally know anyone who is transgender does not remove our obligation to protect those who are abused because of that ignorance. That has always been the role of the government, according to the Constitution, to protect vulnerable minorities from the tyranny of the majority. We have a unique role to fill now as educators. 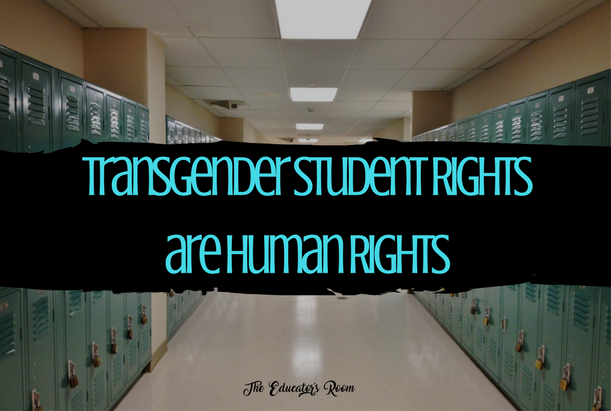 No matter what your personal beliefs, transgender students EXIST. They are human beings and they deserve the same rights and the same protections as all other students. The fact that they must live in a world of violence because of who they are means we must go the extra mile to ensure that their very basic, every day needs not be part of that violence against them. Forcing them to use (or not use) facilities that have nothing to do with who they are is based on the same insidious bigotry that enforced “colored” water fountains and bathrooms until only a few decades ago. And as Dolan-Sandrino states in her article, this is about way more than bathrooms. Now that the new administration has outrightly set itself in opposition to the protection of LGBTQ young people, we must stand in the gap and be the adults that these students need. A place to start, if you are unfamiliar with how to be an advocate for your LGBTQ students, is with the Trevor Project. The Trevor Project was founded in 1998 by the makers of the film “Trevor” and provides intervention and help to LGBTQ students and their allies. They have extensive resources for educators on how to advocate for, protect, and be an ally to their vulnerable LGBTQ students. Educators got into the business of teaching and guiding young people because at our core, beneath our love for the subjects we teach, we love those young people. We are often the first line of defense for them, and in our modern American society that can mean anything from remediating their learning, making sure they are healthy and have food to eat, or, in this case, protecting them from discrimination and abuse. We set the example for them of how adults should treat them, and that responsibility is sobering and serious in times like this. Under this new administration, our students of color, our immigrant students, our Muslim students, and now our LGBTQ students are living in a world a fear. They have no more guarantees that their own government cares for them. But despite that they have the right to exist. And they have the right to thrive. It’s now our job to make sure that happens for them no matter what this government tells them.